If you find the routine of changing tyres with the changing seasons a bit of a faff, then read on. The Continental Grand Sport Extra tyres are intended for winter/training and sportives, but are even good enough to give you an introduction to racing if you decide to dip your toe into the world of competitive cycling. 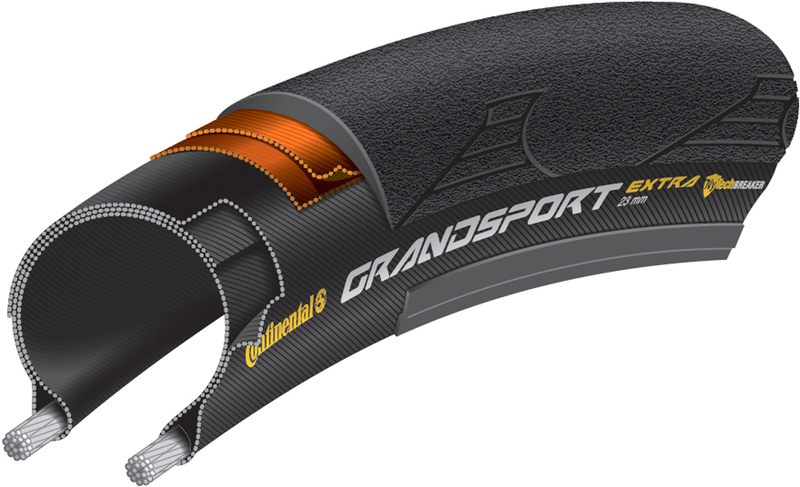 The Grand Sport line was first introduced last winter, and is the lowest rung on the ladder of Continental’s road tyres. The Light and Race models sit alongside the Grand Sport Extra, which offers an extra puncture protection features, adding a little to the price meaning that it is available for £34.95. At the heart of the Continental Grand Sport Extras is the Pure Grip compound. For those unfamiliar with Continental’s range of tyre compounds, this is the rung below the top level BlackChili Compound that graces the likes of the excellent Continental GP4000S tyres. In fact the Pure Grip compound is more commonly found in Continental’s cross-country mountain bike tyres, which gives a hint as to the toughness of these tyres. Out on the road the performance is as expected from a tyre of this level. The Continental Grand Sport Extra offer good levels of grip in both dry and wet conditions, allowing you to lean confidently into corners on descents knowing you’ll make it out the other side in one piece. It might be too much to expect these tyres to cope with the cut-and-thrust of a technical criterium, but for training and sportives they’re more than good enough. This is also the case with rolling resistance. We tested a pair of 25mm tyres (23mm and 28mm are also available) at 100psi, which seemed only slightly slower than lighter race tyres, something which might add up in a time trial but which shouldn’t worry you too much on training rides. However the improvement in rolling resistance over more heavy duty winter tyres should make the long miles pass a little quicker. 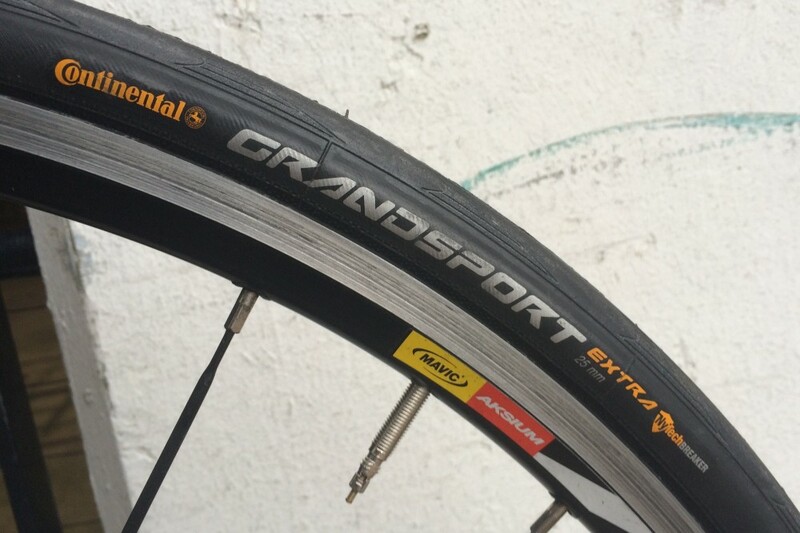 The extra five quid over the £29.95 Light and Race models gives the Continental Grand Sport Extra tyres a second layer of NyTech Break puncture protection technology. This is another new development by the German company which is designed to offer lightweight puncture protection alongside low rolling resistance while keeping the air in your inner tube and the money in your wallet. Fortunately there’s little to say on this point. The Continental Grand Sport Extras were subjected to some pretty shoddy Surrey lanes (including one which was closed for roadworks and consequentially covered with debris) and your correspondent was never forced to reach for the mini pump and tyre levers at the sound of escaping air. Either we were very lucky or the Continental Grand Sport Extras offer good enough protection to keep the wheels rolling this winter. The Continental Grand Sport Extra tyres are solid do-it-all clinchers which will provide reliable performance in training and sportives. They might not be gracing the World Tour any time soon, but are well priced and will do what they're told, as long as you don't push them too far.